How to Watch Encrypted Blu-ray on Kodi via USB Flash Drive? Kodi can be used to play almost all popular audio and video formats around. It was designed for network playback, so you can stream your multimedia from anywhere in the house or directly from the internet using practically any protocol available. Kodi even can play CDs, DVDs and Blu-ray directly from the disk or image file. But you should know, the Blu-ray here, means unencrypted one. Kodi claims in their official site, that it only supports unencrypted Blu-ray playback. So what about your commercial Blu-ray disc? How to play these encrypted Blu-ray movies on Kodi? That is a easy job! You can change the commercial, encrypted Blu-ray to unencrypted one. With Pavtube Video Converter Ultimate (Review), you can full copy Blu-ray, directly copy Blu-ray and transcode Blu-ray to common MP4, AVI, MOV format supported by Kodi. Each way of these can remove Blu-ray copy protection to achieve the goal of playing Blu-ray on Kodi. 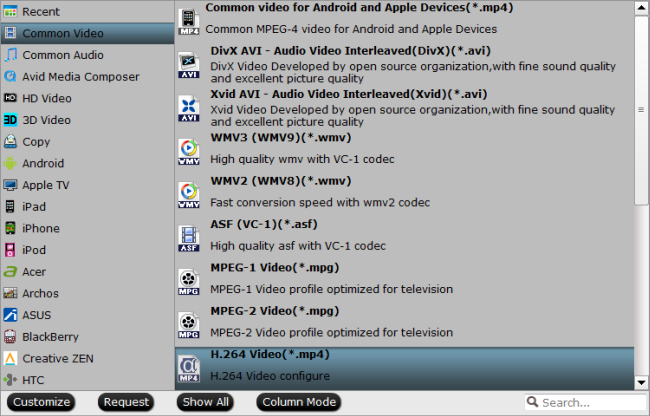 As Kodi supports different codec, such as H.263, H.264, H.265(as from Kodi 14), MPEG, Pavtube Video Converter Ultimate allows you to change the codec in profile settings. Click “File” to find “Load from disc” to import source Blu-ray movies to Encrypted Blu-ray to Kodi software. In fact, this app not only can deal with Blu-ray, is also works in DVD/4K/HD/SD video and TV Programmes, Music Drama and other videos. Full disc copy allows you to keep the whole file structure in your Blu-ray disc complete without any quality loss. Click the “Copy the entire disc” button on the top menu to start Blu-ray full disc copy. Note: On Windows, when you backup Blu-ray to H.264 videos, the app can provide you 6X fast ripping speed with GPU Acceleration. 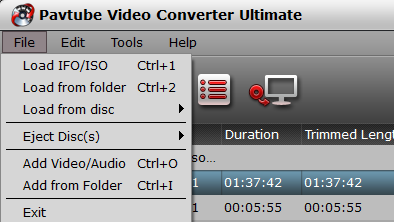 Tip: All formats here are set with optimized video/audio codecs, bitrates, frame rates, etc. But you can still specify as you like by clicking Settings button. In the Profile Settings window, you can choose or specify exactly the parameters you like. And in the Task information section, you can compare the detailed information of the source video and the target video. If you choose the second or third way to copy DVD movie, you need to hit the “Convert” button in bottom right corner to start Blu-ray main movie copy or Blu-ray to MP4, MOV and AVI conversion. When the process is completed, open output folder and find the ripped Blu-ray file. After you ripped encryption Blu-ray to unencrypted one, you can insert your USB Flash drive and open it. Then transfer the ripped Blu-ray movies into flash drive. Afterwards, you can play this Blu-ray movies on Kodi smoothly. Just enjoy! How to Watch Blu-ray on Popcorn Hour A-400 With ISO/M2TS/MKV format? How to Playing Blu-ray on Quicktime on Mac? How to Rip and Backup Blu-ray on Mac OS X EI Capitan?